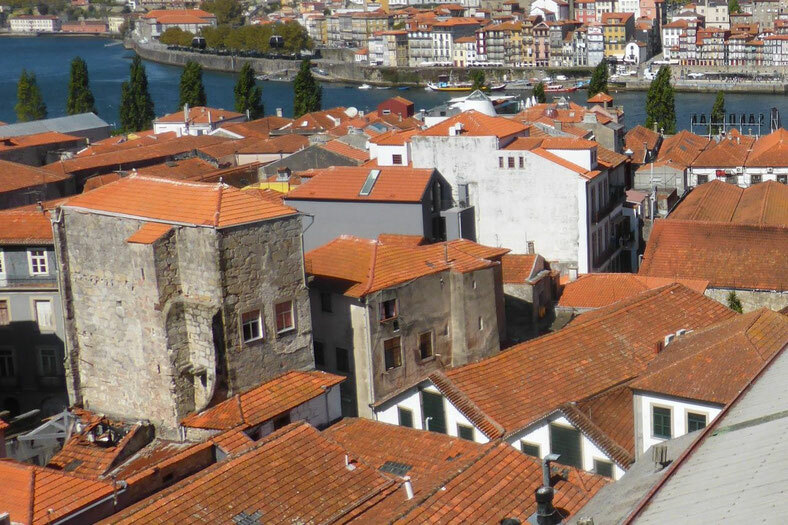 We had a near miss with an unfortunate incident today, on the way to visit one of Porto's many port wine tasting cellars. 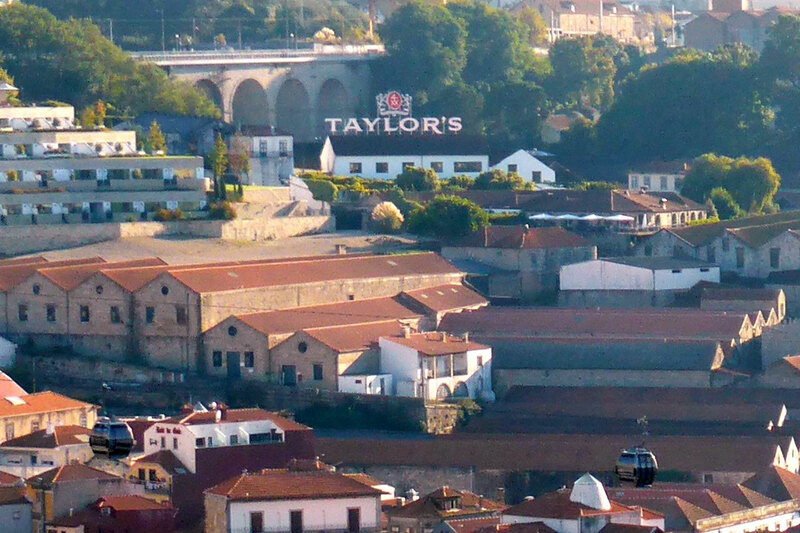 The port tasting cellar that we visited was Taylor's in Vila Nova de Gaia, on the opposite side of the river Douro from Porto. The streets in such areas are narrow, close, and twisted, which makes them very difficult to represent on a map, so only a small proportion of the streets are named on the map. In the real world, many streets do not have street name signs, and it is a rare coincidence for a street to be named both on the map and on the ground. The outcome of this is streets full of visitors standing on street corners staring at maps or smart phones, trying to work out where they are. So on our way to Taylor's we got somewhat lost, and didn't find our location on the map until we had gone past our destination, and had to loop back. This took us out of the tourist areas and into an isolated area of a railway line, overpasses, and ramps. Here we found two older British tourists covered in dirt, grass scuffs, and bleeding grazes. They told us that only minutes before we found them they had been attacked, thrown to the ground, dragged onto the road, and violently robbed of their bags and cameras, the thieves disappearing by climbing up onto the railway overpass. We comforted and advised they for a few minutes before they somewhat dazedly headed off to find the police to report what had happened. I can well image the process they were about to embark on, the time that they would put into police paperwork and insurance claims, and the inconvenience they would suffer of not having whatever was stolen for some time, especially if they lost passports, credit cards, or driver's licences. I have no idea if the attack was opportunistic, or if the thieves were waiting to ambush tourists who had wandered out of the nearby crowded tourist areas; but, undoubtedly, if the British tourists hadn't been there and been attacked we very likely would have been, as we passed by only minutes after it happened. We were very lucky because of their misfortune! I'm sure that a major incentive for this sort of attack is walking around with a large and obviously expensive DSLR camera on a strap around your neck, as so many tourists do. My camera is a compact zoom camera, which fits in my jacket pocket, and even when I'm hand carrying it, it is almost entirely engulfed by my large hands; and, anyway, its not an obviously (or actually) expensive camera. Unfortunately, it's impossible to completely alleviate the risk of such occurrences. Of course, they can happen in any city in any country in the world; certainly, they happen in Australia. You always try the judge the nature of the area that you are walking into, and try to avoid anywhere entirely isolated, but when you're here to explore you have to balance the risk against the gain. Yes, you never know what multiple levels of complexity and subtlety there may be in attack or a scam. Before I read to the end I actually thought the British tourists were a ruse - ie purposefully scratched and dirty in order to attract your un-guarded sympathy and then their buddies jump out and get you. This does happen, and its happens with British people robbing 'other' tourists in foreign countries! Shame for those real victims though. Hi Elea; no, we were on foot; the theives had simply accomplished what they had set out to do, and left. Thanks Simone; yes we're fine, just a tiny but shaken. It was probably a great comfort to those unfortunate people to see you there so soon after their misfortune. You never know - the thieves may have heard your car approaching the area and cleared out before doing more harm.